When I was little, there was an ice cream truck that routinely visited the Connecticut projects where we lived. For people who couldn’t afford vacations, it was one of the few ways you could really tell that summer had arrived. That, and at the tail end of the baby boom the neighborhood was lousy with kids. You couldn’t have come up with a better place to sell ice cream if your life depended on it. Our ice cream truck was run by an Italian guy named Tony. Whenever we’d hear that distinctive ice cream truck music (you know the kind. “Turkey in the Straw” was the most popular.) you would hear kids screaming, “Tony! Tony!” for blocks. We all would be running into our houses to beg our mothers for money, and it seemed unbelievably urgent, because for some reason we were convinced that if we didn’t hurry, he’d drive away before we made our purchases. Using the hindsight of an adult, it’s obvious that the man wasn’t going anywhere. We were his bread and butter, just as he was our sugar. I always got the same thing. A grape Italian ice. Only once did I get adventurous and try something different, and I knew the instant I tore off the wrapper that I wouldn’t like it. Tony’s assistant, probably his younger brother, noticed this. He took it from me, took a bite out of it, and then said, “Hey Tony! Whada ya doin’, trying to sell dis little girl some ice cream wid a bite outta it? Are you crazy, or what?” Tony gave me my Italian ice that day, and taught me a little bit about customer service, too. He winked at me. As the years went on, Tony left and was replaced by someone else, but we all still called him Tony. 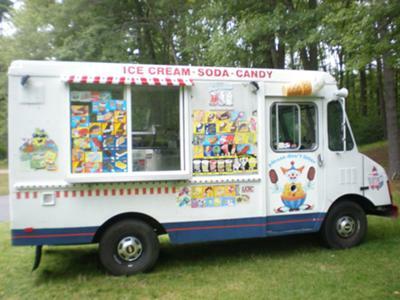 And to this day, whenever I hear an ice cream truck, I think, “Tony! Tony!” and it makes me smile. The man went to his grave without knowing what an impression he had made on me. He was, without a doubt, one of the best things about my childhood. Thanks, Tony! Just store them up for the winter.